Strange as it might sound to modern-day educators, there was a time in the not too distant past when people questioned the importance of schools and teachers. Specifically, the 1966 report entitled Equality in Educational Opportunity and commonly referred to as the Coleman report in deference to its senior author (Coleman et al., 1966) involved more than 640,000 students in grades 1, 3, 6, 9, and 12 and concludes the following: “Taking all these results together, one implication stands above all: that schools bring little to bear on a child's achievement that is independent of his background and general social context” (p. 235). This was a devastating commentary on the potential (or lack thereof) of schools and teachers to positively influence student achievement. In general, these results were interpreted as strong evidence that schools (and by inference the teachers within them) make little difference in the academic lives of students. Since then a number of studies have provided evidence for a different conclusion (for a discussion, see Marzano, 2003b). Indeed, those studies demonstrate that effective schools can make a substantial difference in the achievement of students. In the last decade of the 20th century, the picture of what constitutes an effective school became much clearer. Among elements such as a well-articulated curriculum and a safe and orderly environment, the one factor that surfaced as the single most influential component of an effective school is the individual teachers within that school. Many studies have quantified the influence an effective teacher has on student achievement that is relatively independent of anything else that occurs in the school (for discussions see Haycock, 1998; Marzano, 2003b; Nye, Konstantopoulos, & Hedges, 2004). Of these studies, the one by Nye, Konstantopoulos, and Hedges is the most compelling because it involved random assignment of students to classes controlled for factors such as the previous achievement of students, socioeconomic status, ethnicity, gender, class size, and whether or not an aide was present in class. The study involved 79 elementary schools in 42 school districts in Tennessee. Figures I.1 and I.2 depict Nye and colleagues' findings. Figure I.1 indicates that students who have a teacher at the 75th percentile in terms of pedagogical competence will outgain students who have a teacher at the 25th percentile by 14 percentile points in reading and 18 percentile points in mathematics. Figure I.2 indicates that students who have a 90th percentile teacher will outgain students who have a 50th percentile teacher by 13 percentile points in reading and 18 percentile points in mathematics. Again, Nye and colleagues (2004) note that these differences are significant enough to imply a need for policy changes. It is important to remember that the Nye study was conducted in lower elementary grades. However, given the statistical controls employed and the consistency of their findings with other studies at different grade levels, one can conclude that the question as to whether effective teachers make a significant difference in student achievement has been answered. They do! Whereas Nye and colleagues' (2004) study was not intended to identify specific characteristics of effective teachers, this book is. However, just as Nye's team qualified its findings, I too must qualify the recommendations made in this book. 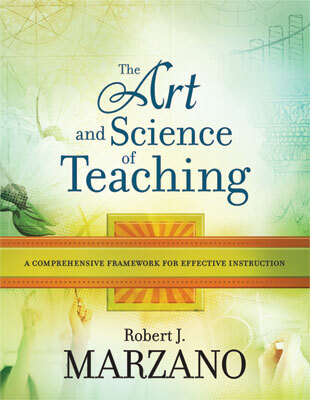 Notice that it is titled The Art and Science of Teaching. In this text I present a fair amount of research. One might conclude from this that I believe teaching to be a science. It is certainly true that research provides us with guidance as to the nature of effective teaching, and yet I strongly believe that there is not (nor will there ever be) a formula for effective teaching. This is not an unusual claim. Many researchers and those who try to apply research (a category into which I place myself) would probably agree. Commenting on educational research in the 1970s and 1980s, Willms (1992) notes, “I doubt whether another two decades of research will . . . help us specify a model for all seasons—a model that would apply to all schools in all communities at all times” (p. 65). A similar sentiment is credited to the famous mathematical statistician George Box, who is reported to have said that all mathematical models are false but some are useful (de Leeuw, 2004). In effect, Box warned that mathematical models that form the basis of all quantitative research are approximations only of reality, yet they can help us understand the underlying dynamics of a specific situation. Reynolds and Teddlie (2000) address the issue in the following way: “Sometimes the adoption of ideas from research has been somewhat uncritical; for example, the numerous attempts to apply findings from one specific context to another entirely different context when research has increasingly demonstrated significant contextual differences” (p. 216). Even though the comments of Willms (1992) and Reynolds and Teddlie (2000) address the broader issue of school reform, they are quite applicable to research on classroom instruction. No amount of further research will provide an airtight model of instruction. There are simply too many variations in the situations, types of content, and types of students encountered across the K–12 continuum. The individual medical practitioner must sift through a myriad of studies and opinions to build a local knowledge base for interacting with patients. So too must the practitioner in education. Educational research is not a blunt instrument that shatters all doubt about best practice. Rather it provides general direction that must be interpreted by individual districts, schools, and teachers in terms of their unique circumstances. In short, research will never be able to identify instructional strategies that work with every student in every class. The best research can do is tell us which strategies have a good chance (i.e., high probability) of working well with students. Individual classroom teachers must determine which strategies to employ with the right students at the right time. In effect, a good part of effective teaching is an art—hence the title, The Art and Science of Teaching. Viewing teaching as part art and part science is not a new concept. Indeed, in his article entitled “In Pursuit of the Expert Pedagogue,” Berliner (1986) ultimately concludes that effective teaching is a dynamic mixture of expertise in a vast array of instructional strategies combined with a profound understanding of the individual students in class and their needs at particular points in time. In effect, in different words, Berliner characterized effective teaching as part art and part science more than two decades ago. In short, the components of effective pedagogy can be symbolized in part as shown in Figure I.3. This book combines my previous works on classroom instruction and management just cited along with information from Classroom Assessment and Grading That Work (Marzano, 2006). It does so in the context of a comprehensive framework of effective teaching. It is a framework offered as a model of what I believe every district or school should develop on its own. Specifically, I recommend that schools and districts generate their own models using this one as a starting point. There are other models, in addition to this one, districts and schools might consult in their efforts (see, for example, Good and Brophy, 2003; Mayer, 2003; Stronge, 2002). The comprehensive model offered in this book is articulated in the form of 10 design questions. They are listed in Figure I.4. What will I do to establish and communicate learning goals, track student progress, and celebrate success? What will I do to help students effectively interact with new knowledge? What will I do to help students practice and deepen their understanding of new knowledge? What will I do to help students generate and test hypotheses about new knowledge? What will I do to engage students? What will I do to establish or maintain classroom rules and procedures? What will I do to recognize and acknowledge adherence and lack of adherence to classroom rules and procedures? What will I do to establish and maintain effective relationships with students? What will I do to communicate high expectations for all students? What will I do to develop effective lessons organized into a cohesive unit? © 2005 by Marzano & Associates. All rights reserved. The remaining chapters address these questions in some detail. They represent a logical planning sequence for effective instructional design. Question 10 is an omnibus question in that it organizes the previous nine into a framework for thinking about units of instruction and the lessons within those units.